The Division of Agricultural and Forestry Sciences was established in 1995, after the reorganisation of the Division of Biological, Medical, and Agricultural Sciences. The new division was chaired by Veronika Vasiliauskienė and Albinas Kusta, two terms each. At present, the division has 11 full members, ten members emeriti, and eight foreign members and is headed by Zenonas Dabkevičius. 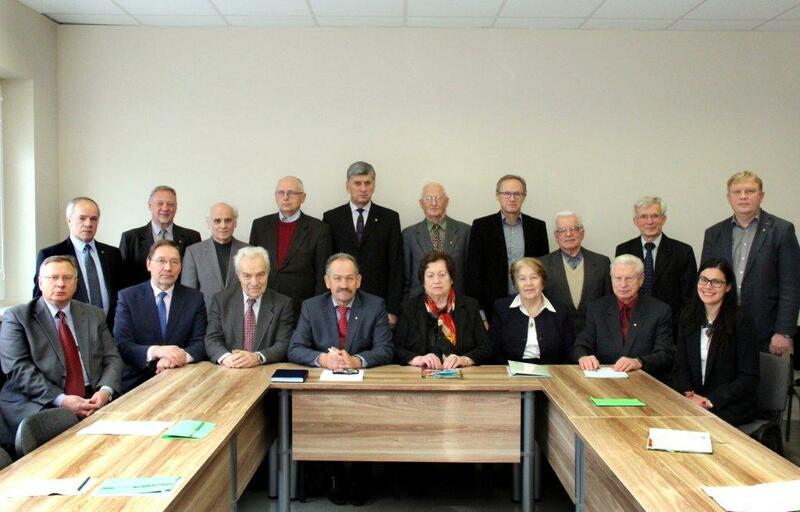 The division works in five sections: agronomy (chair Vidmantas Stanys), forestry (chair Darius Danusevičius), zootechnics and veterinary medicine (Henrikas Žilinskas), agriculture and environmental engineering (chair Algirdas Raila), and agrarian economics and sociology (chair Vlada Vitunskienė). There are also two commissions – of food quality and safety (chair Pranas Viškelis) and soil sciences (Jonas Volungevičius), and the Water Council (chair Arvydas Povilaitis). The activities of the division are concentrated on the solution of the most relevant scientific issues in agriculture and forestry, husbandry and veterinary, environmental engineering, plant and animal biology and parallel fields and directions, on the promotion of research results, development of and innovations in experimental agriculture. Considerable attention is being paid to inter-institutional, interdisciplinary, and international relations, and to promoting the prestige of agrarian sciences. The division organises international and local scientific conferences, discussions, and seminars, and is actively encouraging the activities of young scientists. Members of this division have conducted many significant research studies. Leonardas Kairiūkštis developed the theory of the formation of forest stands, while Stasys Karazija is the author of forest typology theory. Algirdas Sliesaravičius pioneered research into plant biotechnology in Lithuania. Veronika Vasiliauskienė is one of the authors of the school of grassland husbandry, Albinas Kusta is one of the initiators of the ‘Nemunas’ valley of research, studies, and business, and Zenonas Dabkevičius is a promoter of the school of plant pathology. Members of this division are engaged in genetics, selection, and development of new plant varieties: Vidmantas Stanys focuses on horticulture, Vytautas Ruzgas on winter wheat, Darius Danusevičius conducts research into the genetics of forest plants, and Alfas Pliūra investigates the genetic variety of forest plants. Significant results have been achieved by members of the zoo-technology and veterinary medicine section. Česlovas Jukna and Vytautas Konstantinas Sirvydis have developed modern nutritional technologies of domestic birds and animals, respectively; Henrikas Žilinskas has been working on the improvement of animal reproductive qualities, Vidmantas Bižokas’s research is focused on veterinary surgery and lymphology. Antanas Sederavičius conducts and organises research into the diagnostics of the digestive tract of livestock. Pavelas Duchovskis is a promoter of the school of plant ontogenesis, phytophysiology, and ecophysiology, and Juozas Motuzas examines the soils of Lithuania and has compiled their classification. Arvydas Povilaitis’s scientific research deals with water resources and their exploitation, and Algirdas Raila focuses on thermoenergetic processes in biotechnologies. Pranas Viškelis has developed products and innovative technologies for processing biologically valuable food of plant origin. Members of the division take part in various local and international research programmes and projects and provide qualified expertise. Every year, they publish 50-60 research papers, 2-3 relevant monographs, 3-4 books or textbooks.